As Canada’s leading first aid and safety charity, St. John Ambulance remains committed to our history of caring and saving lives. Our mission is to enable Canadians' health, safety and quality of life through training and community service, and we live our mission by practicing the values of teamwork, respect, loyalty, and integrity. At St. John Ambulance of British Columbia and the Yukon, we provide online and local safety training courses as well as an online retail store for first aid and safety products for your work, home and play. To visit the St. John Ambulance Canada site, please visit www.sja.ca. At St. John Ambulance, we focus all of our efforts to ensure people are S.E.T with Safety Education & Tools at work, home and play. Through our training and products, our impactful team and history, and our dedicated charitable community services, St. John Ambulance is the Safety Partner for every resident in British Columbia and the Yukon. Building on a 900-year tradition, St. John Ambulance partners with individuals and organizations to provide first aid and CPR training and products. As a self-funded charity, proceeds from training and product support our volunteer-based community care programs. In British Columbia and Yukon, we serve our communities through a network of 25 branches and 100 staff members, where we train over 80,000 students annually through our 10,000+ classes. Our volunteers also provide first aid in their communities to keep people safe at public events, and also improve quality of life through community care programs that help seniors, and provide leadership opportunities for our youth. We are consistently campaigning to raise public awareness of first aid, CPR, and safety and strive to have every British Columbian and Yukonian S.E.T. with Safety Education Tools at work, home and play. As one of the oldest humanitarian organizations in the world, the Order of St. John first established its unmatched history of caring and saving lives more than nine centuries ago. Generation after generation, the Order of St. John moved wherever human suffering and conflict called out to them, and with each new community they entered, a new hospital was established. The military activities of the Order of St. John come to an end when Napoleon captures Malta. The Knights of St. John devote themselves to charity. The Order of St. John in England offers to do ambulance work in the field during the Franco-Prussian War. The Order in England forms the St. John Ambulance Association to teach first aid, home nursing and related subjects. St. John Ambulance is established in Canada. Volunteers in the St. John Ambulance Association form the St. John Ambulance Brigade, echoing the traditions of the highly disciplined military knights. Queen Victoria grants a Royal Charter to the Order. St. John Ambulance is established in B.C. During the First World War, the Order of St. John, as part of the Joint War Committee in England, helps establish a massive effort to provide medical services and field hospitals. During the Second World War, St. John’s role included organizing the national anti-gas training program, running first aid posts in London’s subway stations during the Blitz, assisting prisoners of war, and providing medical reserves and volunteer nurses to serve with the Allied Forces. Canada becomes a Priory of the Most Venerable Order of St. John. St. John Ambulance Medical First Response volunteers treat more than 2,500 patients at the Winter Olympics in Calgary. The St. John Ambulance brigade also celebrates in the UK for a century of service and achievement. Over 40,000 brigade members from all over the world attend the celebration, and another 120,000 St. John Ambulance supporters. The Order of St. John is formally incorporated into the Canadian honours system as a Canadian order – the only charitable organization to be included to date. St. John Ambulance creates the Therapy Dog program in Peterborough, Ontario to provide affection and comfort to the sick, bedridden, elderly, and lonely. St. John Ambulance partners with Public Safety Canada and four other organizations to launch the 72 Hour Campaign, encouraging Canadians to be self-sufficient in the event of an emergency. St. John Ambulance volunteers provide Medical First Response for spectators at the Canada Winter Games in Prince George, B.C. 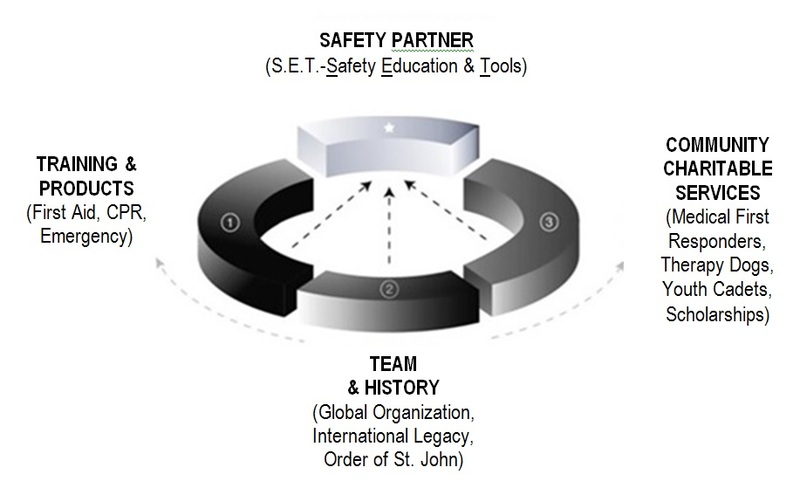 We provide you with Safety, Education & Tools so you're S.E.T. no matter your workplace or industry. Our online courses require minimal time to complete, but are self-paced giving you the ease, convenience, and control you need. Courses are also compatible with any mobile device. With a broad range of partnerships with major industries and businesses to provide first aid and safety training, you can expect industry-recognized and compliant training. Some of the organizations we’ve partnered with include BC Hydro, CIBC, BC Ferries, Telus, CN Rail, London Drugs, Sprott Shaw Community College, Mark’s Work Warehouse, McElhanney, and the BC Municipal Safety Association. Plus, we're still the training provider of choice for the Canadian Armed Forces. As one of the oldest humanitarian organizations in the world, the Order of St. John established its unmatched history of caring and saving lives more than nine centuries ago. Building on that tradition, St. John Ambulance has over 100 years of history in Canada. We issued the first certificate for first aid training in 1883, and by 1892, we had 12 branches teaching first aid from coast-to-coast. Our first aid, CPR, and safety training are led by a highly skilled network of professionals. We also work closely with regulatory agencies, helping to set the standard by which other providers operate. A great and easy to follow course that had me WHMIS certified in no time. My employer also had the utmost confidence in St. John Ambulance's reputation - I'd definitely retrain with them.